Masala—more formally known as "garam masala"—is a blend of ground spices common in India, Pakistan, and other South Asian countries. The spice blend is perfect as a base for fish, chicken and pork dishes, such as fish hara green masala and chops hara masala, a popular Indian pork recipe. 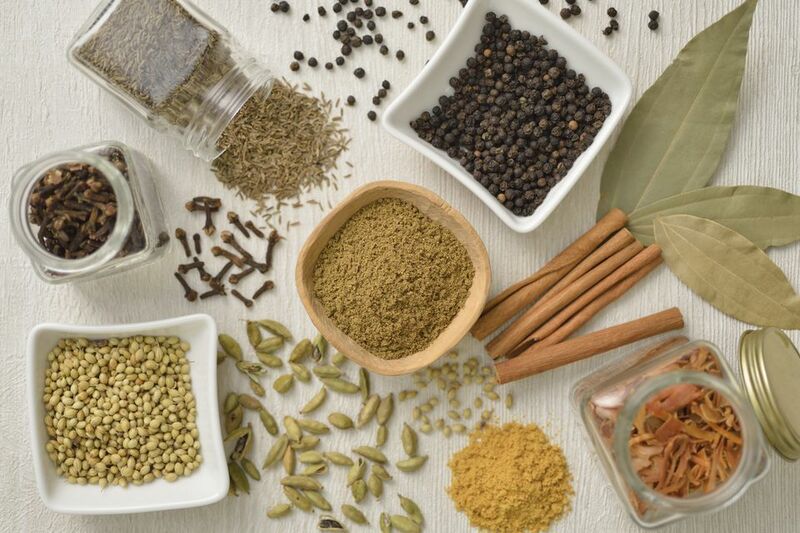 Though this blend of cinnamon, nutmeg, cloves, cardamom, peppercorns, and cumin is traditionally used for Indian foods, "recently, chefs have started adding garam masala to marinades, salad dressings, and other dishes," according to NPR's Monica Bhide. "Garam" means "heat" in Hindi, one of the main official languages spoken in India, but the masala spice blend is not actually hot. "It means that the spices raise the heat of the body by raising the metabolism," Bhide notes. For that reason, you'll often find this spice blend simply referred to as "masala" in many Indian recipes. "Hara," by the way, means "green" in Hindi. The recipe for this masala is a bit of a variation on the traditional blend. You'll use fresh mint to brighten the flavor, garlic, and onion to give the blend a bit of a bite and, in this case, chilies to add heat to the blend. Ironically, you'll really be able to call this version "garam" masala, because you'll be adding as much heat to the mix as you like through the use of the chilies. One other variation here on the traditional masala recipe is the addition of poppy seeds, which add texture to the blend. Grind all of the ingredients into a smooth paste. Add water if required to facilitate grinding or to ensure a smooth texture. Use immediately, or place the mix in an airtight container and store it in a cool, dry place for up to six months. You can―but do not have to―dry-roast some of the ingredients, which will help remove moisture and make the seeds and cloves crispier, so they are easier to grind. If you choose this method, roast the garlic, ginger, cinnamon, poppy seeds, and cloves. Follow the previous directions for preparing the garlic and cloves. Add these ingredients to a heavy-bottomed skillet, and toast the mix over medium heat, stirring continuously to avoid burning the small pieces. Remove the ingredients and set them aside for five to 10 minutes to cool before grinding. You can also use a grinder to grind the ingredients.